In 2012 Feb 15th Government forces shot and killed Anthony Fernando, An innocent fisherman and several other wounded, who were with the other fishers on protest against sudden fuel price increase almost by 50%. 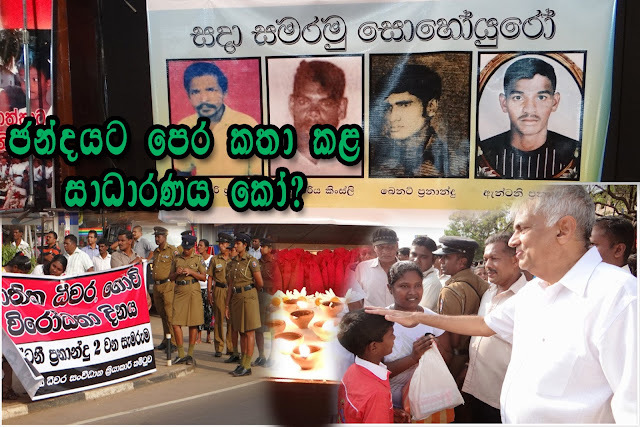 Opposition party at that time, led by the present Prim minister Ranil Wicramasinghe, together with Janatha Vimukthi Peramuna (JVP) built pressure on government and asked to take action immediately. Today they are governing the country. Fuel price has gone down less than 30 USD per barrel. They have imposed highest tax rate for the fuel and no body talk about killed and wounded fishermen in the fight against fuel price hike.